An Italian runner emerged victorious from the Venice Marathon after the favourites took a wrong turn down a cycling path and had to dodge oncoming traffic. Losing two minutes of precious time, Gilbert Kipleting Chumba, Kipkemei Mutai, and David Kiprono Metto from Kenya, and Abdullah Dawud from Ethiopia, the front-runners, were led off course by the leading motorcycle scout who had misjudged a turn. They only managed to travel a couple of hundred yards before realising their mistake, and ran back to take the correct turn. But as they were already 25km into the gruelling race around the outskirts of the lagoon city, the error cost them the title. 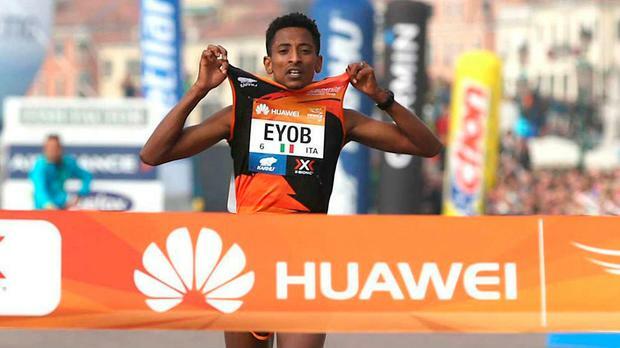 Eyob Faniel (24), a runner for a local club, was originally a full minute behind but managed to catch up the distance and sprint past the finishing line, becoming the first Italian to win the race in 22 years, clocking a time of two hours, 12 minutes and 16 seconds. It was the most dramatic edition in recent memory of the race, the 32nd, which crosses the Brenta Riviera and 14 city bridges. Mr Faniel arrived in Italy from Eritrea with his family in 2003. After trying to become a professional footballer, he switched to athletics and won the Florence Marathon while working as a swimming pool maintenance man. He obtained Italian citizenship in 2015. “I am very happy,” he told reporters. “I want above all to thank the Venice Marathon Club for the path I began with them three years ago, which led me to win in what is effectively my home marathon. Cathal Dennehy Hiko Tonosa and Catherina Mullen reigned supreme on what was a blustery day in the Phoenix Park for the Great Ireland Run yesterday. Cathal Dennehy October 2018, and Ireland's best long jumper sets off down a runway on an indoor track at the University of Ulster. It's Adam McMullen's last jump of a humdrum session, but as he plants his right foot to start generating speed, there is a loud crack.